Having a new camera and also having cleaned up my sewing room in anticipation of starting serious work on my new Lone Star book, it seemed like a good time to provide a new tour of the facility. Some thing have changed since I last did this in 2007. 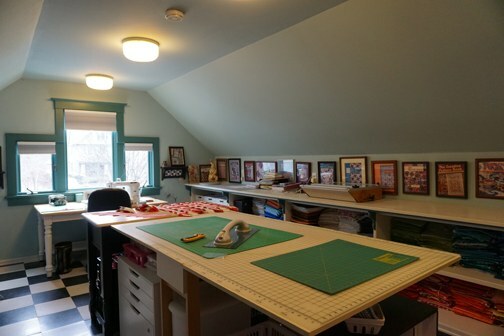 Here is a shot of the front of my attic sewing room. 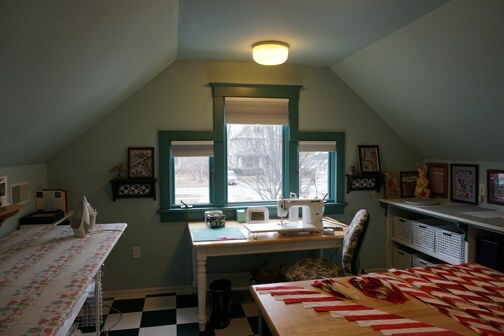 The 36” x 60” sewing table takes center stage under the window. I use every inch of space when I work on a quilt. The rolling office chair assures comfort during sewing marathons. The oversize ironing board is to the left of the sewing table. 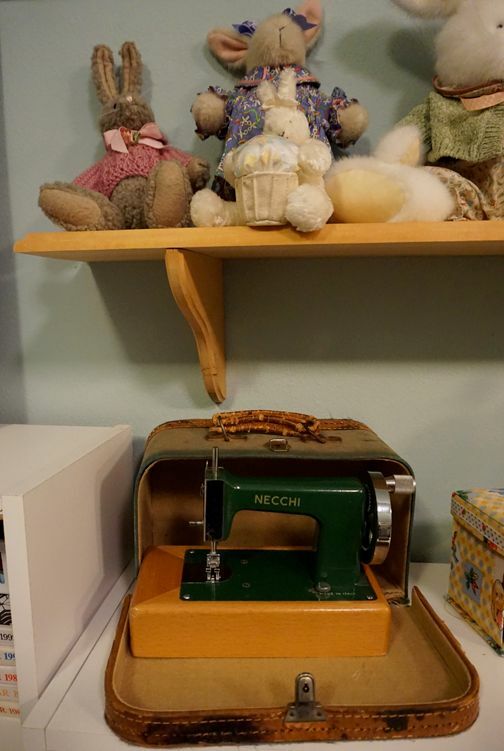 In the corner between the front wall and the ironing board is a small bookcase storing quilting books, sewing machine accessories, and thread. To the right is my long counter with bins of projects and supplies underneath. Four ceiling fixtures (with 150 watts each) light the room. The cutting table runs down the center of the room, taking advantage of the light. After Steve had a stroke, I bought a shower bar for the bathroom, but it would not adhere to the textured tile, so I took it to the sewing room, where I use it as a handle for my rotary ruler. Bins and shallow drawers sort scraps and strips under the cutting table. Above the long counter parallel to the cutting table are framed covers of my books. 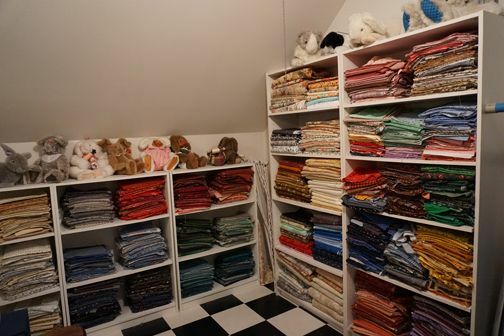 Here is a shot of the back of my sewing room, with the door open to my stash closet. 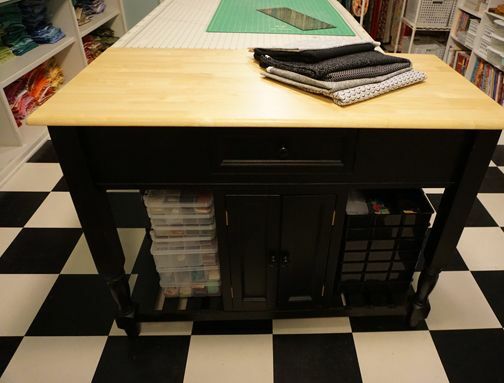 The black counter-height island table provides storage and an extra surface next to my cutting table. 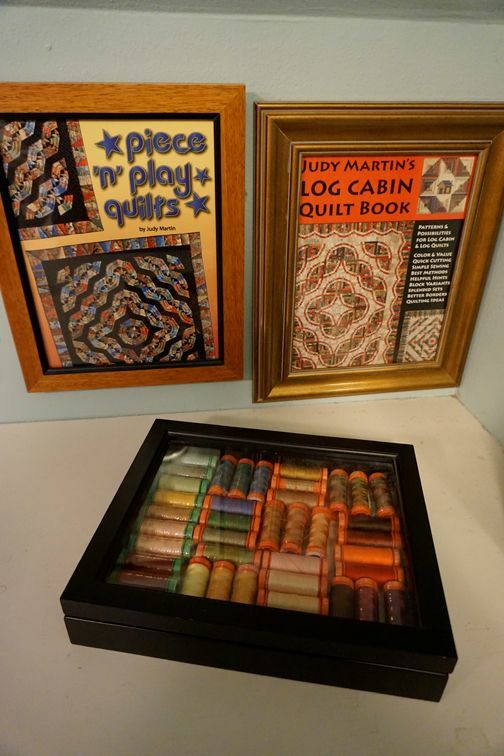 To the right of the cutting table are bookcases holding my quilting books as well as plastic boxes of precut patches that are sorted by finished size. In the foreground, close to both the cutting table and the sewing table, is my ironing board. Along the left of the room is my built-in counter with fabric storage below. 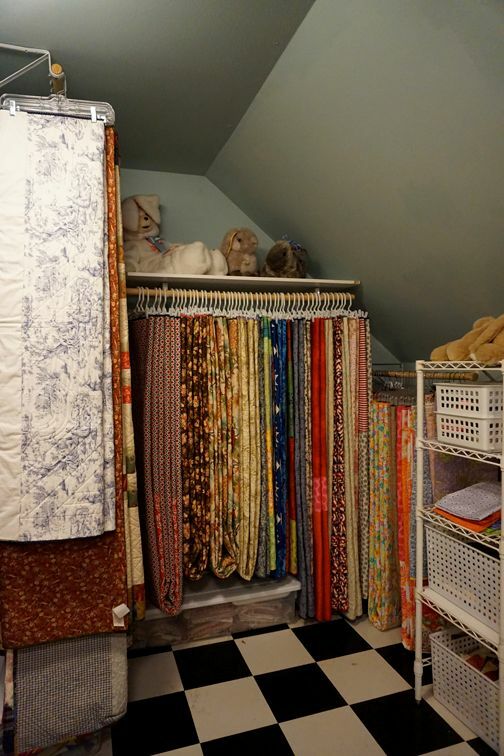 At the back of the room is an alcove I use as a quilt closet. In front of the closet is my rolling quilt rack with bins above and below and another wire shelving unit for project bins. 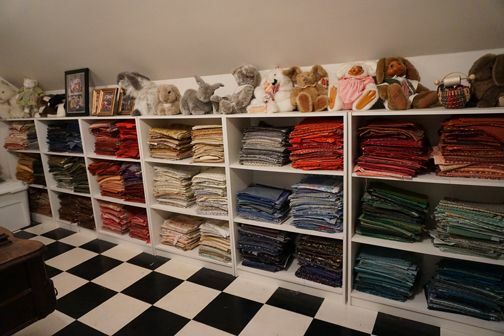 In front of the rolling quilt rack is my portable design wall. It is just five feet high because of the sloped ceilings. In its previous life it was an office cubicle wall. I bought it for $10 at a used office furnishings store and re-covered it on both sides with polyester blend batting with scrim. Small patches and units adhere to it without pinning. Larger units require a couple of pins. 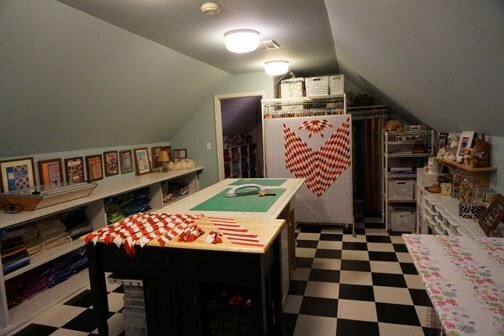 For laying out really large quilts, I fold the gateleg cutting table and roll it and the quilt rack into the stash closet to reveal a large floor space in my sewing room. 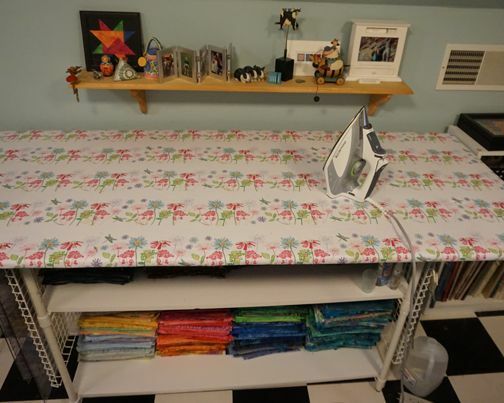 I recently re-covered my 30” x 60” ironing board (for the third time). I made it more than 20 years ago from InterMetro shelving. To save money, I bought Melamine for the two shelves and notched out the corners to fit the poles. The shelves rest on InterMetro side rails. For structural integrity, I added rails to the back side and an InterMetro wire shelf on the top of the shelf unit. The ironing board is plywood covered in cotton batting and fabric and affixed to the underside of the board using a staple gun. I screwed lath strips to the underside of the board to hug the shelf unit and keep the top from shifting. I store my batik stash and ironing supplies on the shelves. Wire grids on the sides of the unit hold my rotary rulers. This small cubby fits under my cutting table. My black-and-white fat quarters fit nicely. 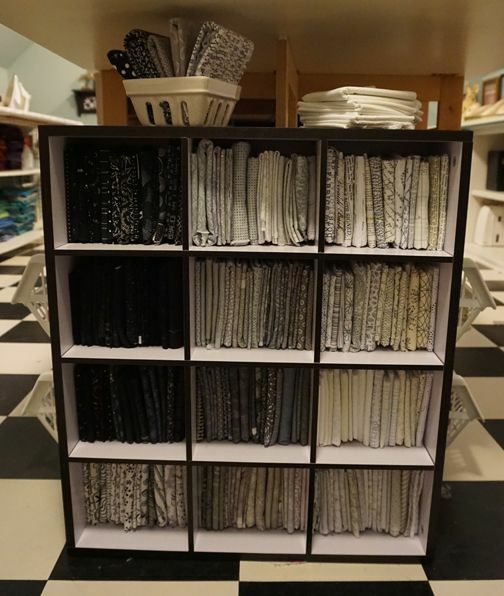 Notice that the shelf and the fabric in it match my black-and-white flooring. I was powerless to resist buying this unit used for about $10. My gateleg cutting table has a handy drawer for my rotary cutters, scissors, and whatnot. 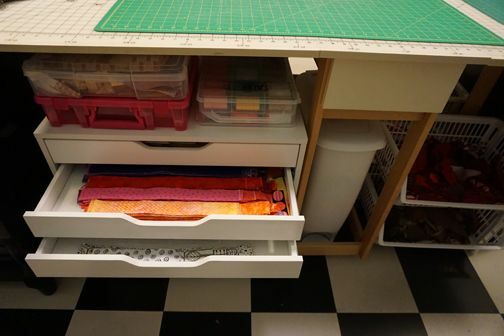 I couldn’t bear to waste the under-table space, so I bought a cabinet with three shallow drawers for precut strips and a file drawer for design ideas. Under the drawer is a step-trash bin; on the right and on the opposite side of the table are color-sorted bins for cutting scraps. I bought this kitchen island on clearance at Lowes years ago. I use it to extend my 36” x 72” cutting table. This is especially handy when I accordion fold my larger quilts to hang them from skirt hangers. The drawer stores all my office supplies. The shelves under the island hold clear tackle boxes and black drawer organizers. I use the black ones to keep the different sized or colored patches separated when I am cutting and sewing a quilt. I use the clear ones to store precut logs leftover from quilts I have made. Each size is in a separate compartment. When I start a new Log Cabin, I search for logs here first. On the kneewall opposite my cutting table, I store leftover patches and strips in plastic shoeboxes. Each box has strips or patches of a single size. I list finished sizes instead of cut sizes because patches of different shapes and the same finished size are often used together in a quilt. Below these boxes are books and magazines. These are cheap bookcases, and only the bottom shelves are strong enough for books. 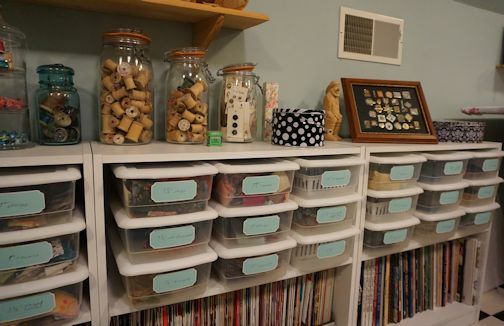 Above the bookcases are jars filled with spools and button cards and a tin with sewing supplies. 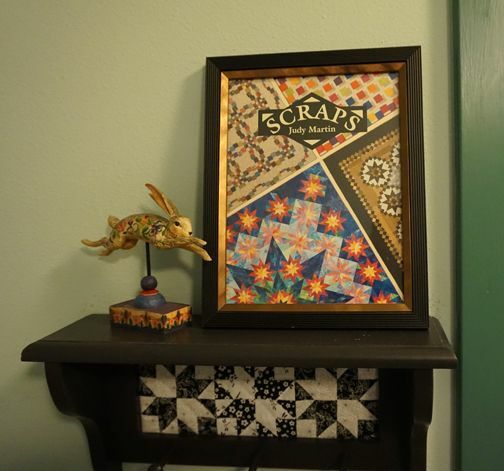 At the far left is an apothecary jar filled with tiny fabric confetti from a quilt I made recently. After trimming the points of diamonds, the snippets looked so pretty together that I preserved them in a jar. I save leftover patches in plastic shoeboxes labeled with the finished size. 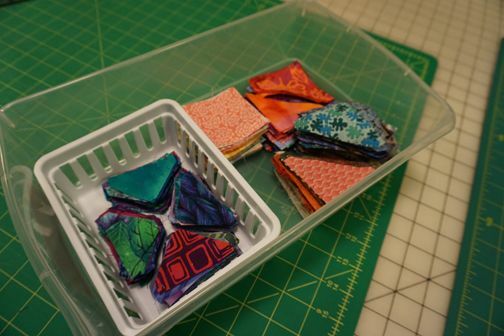 In this box, for example, I have 2” finished patches: squares cut 2-1/2”, half-square triangles cut 2-7/8”, and in the white bin, quarter-square triangles cut 3-1/4”. For some sizes I have so many precut patches that I have a separate box for each shape. I try to organize the leftover patches as soon as I finish piecing a quilt, while I still remember the patch sizes. When I begin a new project, I search these boxes first for patches I now won’t need to cut. I had some leftover InterMetro shelving that I used to make a rolling quilt rack. When my quilts are too big to hang from a rod near my 8-foot ceiling, I accordion fold them and clip skirt hangers to both ends for hanging folded in half, as I have done here. Projects and supplies are stored in the bins above and below the quilts. In the alcove at one end of my sewing room, I have hung closet rods at ceiling height and knee wall height on the side walls. I hung a rod as high as the sloped ceiling permitted on the back wall and added a shelf above it. I keep a step stool handy to reach the highest hangers. Quilts are accordion folded with backing sides out in order to minimize fading. I also added room-darkening pleated shades to the windows so when I am out of the room, the quilts are not subjected to sun damage. I found this pair of cute little black shelves online. They flank the window over my sewing table. 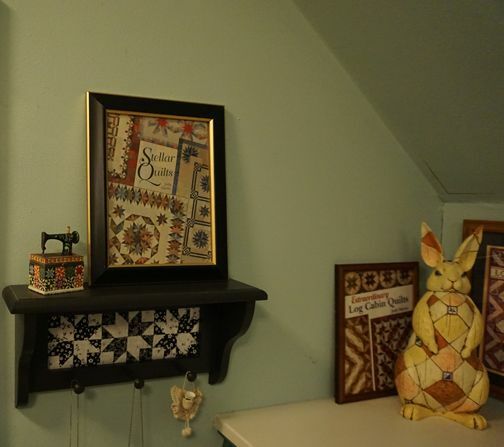 Jim Shore items, sewing notions, and a book cover decorate this shelf. In the corner of the counter are a bunny and my oldest and newest book covers, Log Cabin Quilts and Extraordinary Log Cabin Quilts. A Jim Shore bunny (a gift from a friend) and one of my book covers rest on the shelf on the other side of the window. My small spools of Aurifil thread reside in a hinged-top shadowbox on my counter. Don’t they make a pretty, yet functional, display? On the wall are framed covers of some of the books I have written. This is my walk-in stash closet next to my sewing room. 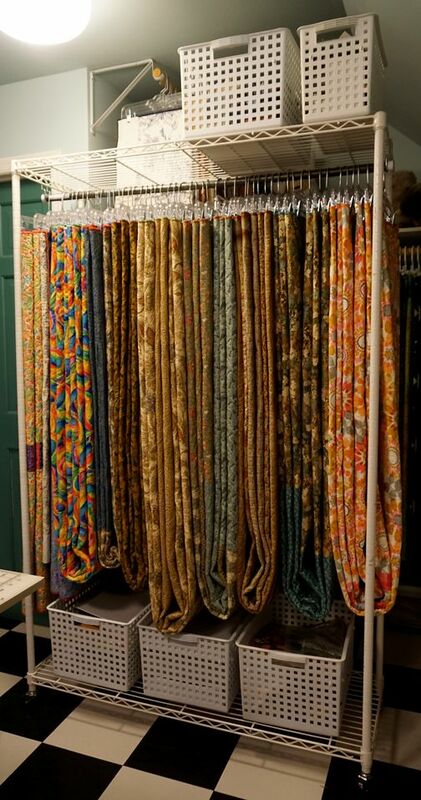 I used to store all my fabric here, but now it is mostly reproductions and 1980s-1990s fabrics here. My Asian, contemporary, and Modern fabrics are under the 24-foot counter in my sewing room, and my batiks are under my ironing table. Jelly jars with a quilted motif hold buttons sorted by color. Many of these were buttons leftover from dressmaking, which I pretty much stopped doing 46 years ago when I started making quilts. Some of the buttons were from my mother’s button box. When I was two years old, my dad returned from a tour of duty in the Mediterranean bearing gifts. My sister and I got matching hand-crank sewing machines. I wore mine out, but my sister gave me hers, and I still have it. I hope you enjoyed the visit. Now I have to get back to work. Those Lone Star quilts won't make themselves!